Around 5:15 PM on 4/22/2019 a concerned citizen brought a potential threat to the District to our attention involving a minor expressing the desire to do harm on school grounds via social media. The district immediately involved law enforcement and we began aiding their investigation into the situation. The initial stages of their investigation concluded around 1:00 AM on 4/23/2019 after a minor was taken into custody by police, allowing us to begin our day normally. We are still in contact with law enforcement as they continue working the case. We want to say a big thank you to the community for being actively involved in this situation. We firmly believe in the mantra “If you see something… Say something” and encourage everyone to continue to be vigilant. This early report helped the District and the Cleveland Police Department immensely in bringing a peaceful resolution to a potential issue. We also want to thank the Cleveland Police Department for their efforts in bringing a quick resolution to this situation. We are truly grateful to be able to partner with them in the protection of our students. Regardless of the situations, Cleveland Public Schools strives to provide a safe and secure school environment for our students. With severe weather season here, there may be times where we will need to take students to one of our many storm shelters. When severe weather is in the forecast we actively monitor conditions using resources from the news media in Tulsa, the National Weather Service, and several weather applications. If conditions look like we will be impacted by high straight line winds or experience a tornadic event, we will move everyone on campus to a shelter. Once we begin a sheltering response for events, including weather related emergencies, as well as hazardous materials emergencies, the school will be locked down and normal student check out will be suspended for the duration of the event to reduce risk to all building occupants. We will work hard to keep everyone as informed as possible before, during, and after a sheltering event by using the District’s messaging services, web page, and social media outlets as we can to keep everyone up to date of the districts status. Here are a few important things to remember if and when a sheltering event occurs. Normal administrative duties and office procedures, will be suspended while all employees give their attention to the safety of students and go to the shelters with them. All outside doors will be locked to prevent unauthorized access. Phones will not be answered. Parents should seek shelter where they are and not come to campus until the weather event is over if that becomes necessary. Once we begin sheltering, parents will be unable to check out their students but if they are in the building they will be allowed to shelter with the students and staff. The priority for Cleveland Public Schools is the protection of the students, faculty and staff on campus. Because of this, all personnel within the school system will be working to assist students in moving to a place of safety and accommodating all student needs, assuring students are given the highest level of protection available. This response will require our undivided attention. Normal administrative duties will be suspended while all employees give their attention to the protection students. The new storm shelter at the Primary School was built as part of our most recent bond project. The Primary is just one of the buildings on campus with multiple shelters thanks to the support of the community. Any person not a school employee who is already inside the school building once we begin to shelter will be given an opportunity to stay in the same areas of shelter as employees of the building. All attempts will be made to keep visitors away from students during the shelter response. Any visitor who wishes to leave may do so if they wish. Parents who are already inside the building when a response occurs will be encouraged to shelter with their student but will not be refused to be allowed to remove their child from the safety of the building. But once a parent is inside the school building and they demand to leave with their child, we will allow it. However, we strongly urge parents who are in this situation to STAY and NOT remove their child during an event requiring going to a shelter as doing so could cause both the parent and the student to be put into danger that could be avoided by staying INSIDE the shelter. Four years ago, Cleveland Middle School implemented a program to help show students what it takes to make a community work. The Tiger Valley Micro Society covers many aspects of community such as running a government, banking, the court system and police, paying taxes, buying supplies, developing and running a business, or being an employee. The orderly running of Tiger Valley starts in the government where students are learning to communicate with citizens to find out their concerns and make laws that positively impact their society. The court system and police officers are learning what it means to uphold those laws and how to implement them through the perspective to keep peace in the community as a whole. Economic development begins with the central bank. The bank is in charge of approving business loans, cashing checks, exchanging Tiger Valley money, and establishing criteria for allowing citizens to take out personal loans. Business owners are required to put together business plans describing what their goals are and to establish a startup budget to request from the bank. Once funded the owners can begin ordering supplies, hiring employees, and setting up a store in the marketplace. Employees learn the steps to applying for a job and following up the hiring process with a good work ethic, diligence, and responsibility. We are thankful for all the life skills our Middle school students are learning while they are in Tiger Valley. We believe the students will be able to look back and see what a difference it has made in their lives and be thankful as well. On October 29, 2018 CPS launched a new program for 3rd through 8th grade students to provide academic enrichment for students after the regular school day has ended through homework help, interest clubs, special guests speakers, summer school, and field trips. 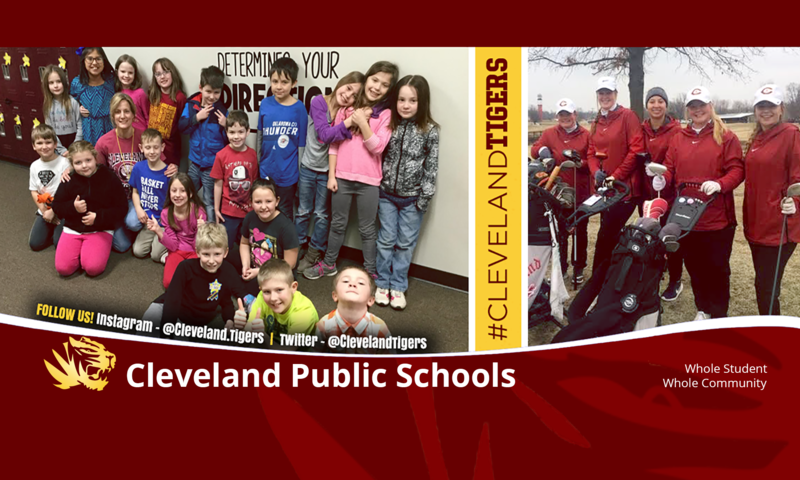 It is called Tiger Club and it’s held from 3:30-5:15, Monday-Thursdays at the Cleveland Intermediate School and staffed by certified teachers. Tiger Club is made possible by a 21st Century Grant that our school district received in August of this year. Each session starts with the students getting a snack and a few minutes of active play until they divide into their individual groups for study time. This time is designated for students to complete their daily homework, receive assistance if needed, and receive additional instruction in math and literacy content. Once the study time concludes, students are allowed to participate in interest “clubs.” The clubs are designed to allow students to investigate areas of interest, to stir their curiosity, and provide fun learning experiences that challenge them academically and intellectually. So far, the students have participated in: Chess Club, Speed Cup-Stacking Club, Archery Club, Lego Club, Art Club, Board Games Club, Technology Club, and Flight Club. New club activities will be introduced about every 6 weeks. In October, students created paper airplanes and competed in a flight competition following a presentation by Dr. Mallory Casebolt, Asst. Professor of Aviation, OSU. On another occasion, students were excited to interact with the high school FFA students when they shared their land projects. We are thankful for the opportunity to serve our students and their families by providing this service. The Tiger Club is free for all students enrolled and we encourage any students interested to sign up. Registration forms can be picked up from the Cleveland Intermediate School’s office. A couple of years ago we began exploring the possibility of incorporating more hands on learning at the Middle School. What started with a single 3D printer has grown into a program covering basic coding skills, circuitry modeling, robotics, and 3D design to help support and improve the students ability to think critically and solve problems. STEM related careers are growing fast in today’s economy and CMS is excited to give students the opportunity to explore those possibilities for their future. Sixth-grade students investigate various types of engineering, testing their creations and analyzing data. Seventh and eighth graders are able to build on their previous experiences in a couple of different ways. One course uses computer aided design software, to create three dimensional models, prototypes and scaled figures that can be printed on 3D printers in the classroom and another experiments in coding (programming) with micro-controllers and robotics. Through the coursework and the newly created STEM Club, students also have opportunities to enter projects in various competitions against students from other districts held throughout the area. The building blocks of interest in STEM are being set by the teachers in the Primary and Intermediate Schools as well. With the inclusion of technology and specific STEM projects into their existing curriculum, the teachers are opening the doors of creativity and discovery for their students. Maintaining small class sizes over the last several years has been a challenge but one we are happy we we were able to accomplish. Since 2008, Oklahoma school funding has decreased by 28%, meaning the state is spending about $1000 per child less today than it was ten years ago. During this same period, state enrollment has increased by over 50,000 students. Adding to this issue has been the teacher shortage which has affected all schools throughout the state. These three factors have caused class sizes to increase in many of our neighboring districts. Mrs. Hays delivering a creative writing lesson to a group of 5th graders. Although these factors have been difficult to navigate, we have continued to make it a priority to keep our teacher-to-student ratio small. Our Pre-K through 5th grade classes have consistently averaged 21-22 students per class, while our 6th – 12th grade classes generally average 22-23 students per class. Neighboring districts at times have seen some of their class sizes reach 30 – 35 students per class. The ability to keep these teacher-to-student ratios at a low number is a great benefit to our students. Many factors have come into play to allow us to continue to accomplish this goal. The community’s support of our latest bond project, Tiger Vision 2016, has played a large role in lowered class sizes. This bond provided money to fund new roofs and air conditioners for our middle and high school, new buses, and an energy management system throughout the district. These things have significantly reduced our yearly maintenance costs and helped regulate our utilities expenditures giving us the ability to use those funds for other things, taking some of the strain off of our building and general funds budget. Additionally, building staff members have pulled together, looking for areas they could help save money without losing programs. Although we still provide teachers a substitute when needed, building staff often cover classes for each other to save money in this area. Partnerships with our community and our teacher driven CPIE organization provide grants to teachers, allowing them to purchase supplies for supplemental educational ideas they want to use in their classrooms. Building administrators pour over student numbers each spring, looking for subject areas that can be consolidated to make better use of our staff and resources. Each of these examples play a role in continuing our small class sizes. Small teacher-to-student ratios have been a priority and will remain so for us. As we make our decisions based on what is best for our students, this is an area that we have refused to compromise, and we are very proud of the fact we have continued to accomplish this goal during difficult financial times.